FRANK DIMON/Sun-Gazette Correspondent Muncy’s Ethan Gush puts Newport’s Brenden Leach on his back during the PIAA Class AA Team Championships at the Giant Center in Hershey on Friday. HERSHEY – The half-nelson Mike Kustanbauter held was deep. It was the kind of half-nelson which forced fans to hold their breath waiting for the moment the referee started swiping for back points. The swipes never came. Instead, just as Kustanbauter was putting Brookville’s Nathan Taylor in danger, the official blew his whistle and put his own hand on the back of his head to signal a potentially dangerous move. Kustanbauter bounded to his feet like he was sitting in a spring. Frustration oozed from his being as he took a long walk around Mat 3 on the floor of the Giant Center. The Muncy bench exploded with more of an incredulous expression than pure anger. In a tied bout with Muncy trailing the District 9 champs by three points, Kustanbauter’s sure-to-come back points would set up the Indians to need just a win in the final bout to win the dual. Instead, those back points never came. Kustanbauter, trying to get the decisive takedown, was caught in a five-point move in the waning seconds and Muncy was eliminated from the PIAA Class AA Team Wrestling Championships on Friday night with a 27-24 loss to Brookville. The loss closed a 1-2 tournament for a Muncy team which entered the tournament ranked fourth in the state. The Indians advanced to the second round of consolations last night by defeating District 3 runner-up Newport in the morning consolation round. Muncy won 18 of the 28 bouts it wrestled Friday, including eight of the 14 bouts against Brookville. But none of those eight wins earned bonus points against the Raiders. Brookville recorded three falls to make up for the lack of bout wins. Muncy had an opportunity to tie the dual in the final bout if Cael Hembury could get the fall, but Tanner LaBenne avoided the big move and held Hembury to a 7-4 win. Had the match gone to criteria, Muncy would have won by winning more bouts. At the end, Muncy was left to do nothing but shake their collective heads and shrug their shoulders in a what-can-you-do manner. Brookville broke out to a 21-3 lead thanks to those three falls in the match’s first five bouts. But slowly Muncy whittled away at the lead. Grady Oden picked up a 5-3 win at 20. Bryce Vollman won, 4-2, in overtime at 132. Mario Barberio (4-0), Christian Good (5-0), Coleman Good (9-2), Gavyn Eisenhower (6-2) and Ty Nixon (9-4) all won by decision to eventually tie the dual at 21-21. It was a methodical process which felt like death by 1,000 paper cuts. But in the moment, it was both momentous and effective. Muncy was dominating each and every bout it was winning. From 132 through 170 pounds, the Indians had an 11-0 edge in takedowns. They also recorded unofficial riding times of 3:51, 4:13, 2:29, 3:17 and 3:04 before Nixon largely worked on his feet. Despite the dominance on top during that run, Muncy recorded just two sets of back points. Christian Good earned three late as time ran out in the third period at 145. Coleman Good used a third-period tilt to flirt with a major decision. Brookville provided so few opportunities for Muncy to record back points as they based out on bottom and worried less about trying to get escapes and more about trying to prevent back points. Eyer was diplomatic with his comments following the dual, but it was clear he and the rest of his team and coaching staff were frustrated by the lack of stalling calls against Brookville. Despite more than 21 minutes of riding time in the eight wins, Muncy induced just one stalling point. Wrestlers on the Muncy bench looked statuesque at times as they stood with a fist in the air asking both officials for a stalling call. But the stall calls never came. And when Muncy needed just two wins in the final three bouts to secure the victory, it could only find one. Ethan Gush allowed a last-second five-point move in a 6-1 loss at 182. And with Kustanbauter dominating the bout after falling behind early 4-0, he got caught in a shot late in the bout ending his hopes at a win. “Of course we want to come back and do what we did last year, but we wrestled tough and we left it all out there,” said Nixon, who was 2-0 yesterday. That’s the solace the Indians are taking into the start of the individual postseason next week with the Central Sectional tournament. They weren’t able to repeat last year’s fourth-place finish, but they walked out of the Giant Center having wrestled two of their better matches of the season Friday. Coleman Good won his 100th career match in the morning as part of six consecutive victories Muncy used to pull away from Newport. He and his younger brother Christian both knocked off state-ranked opponents on the way to a 52-24 victory. 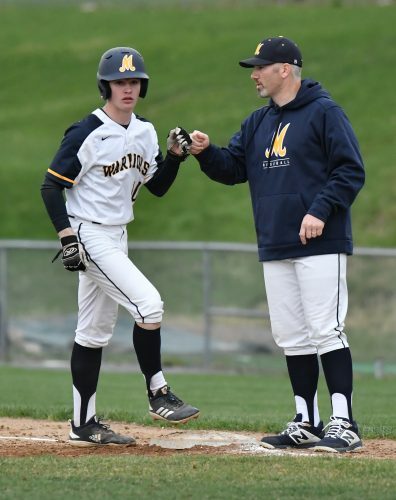 The 52 points were the most Muncy has ever scored in the PIAA team tournament, besting the 51 it scored in last season’s preliminary round against Brockway. 195: No. 12 Mike Kustanbauter, M, pinned Matthew Godbout, 2:20. 220: Cael Hembury, M, pinned Andrew Wright, 0:17. 285: No. 10 Ethan Rode, N, pinned Donovan Diehl, 2:47. 106: No. 13 Ganon Smith, N, pinned Alex Maiorana, 2:09. 113: Chase Crawley, M, pinned Andrew Degiglio, 1:11. 120: No. 19 Grant Kauffman, N, pinned Grady Oden, 0:57. 126: No. 29 Bryce Vollman, M, pinned Dan Capozzoli, 0:52. 132: No. 12 Dorian Gonzalez, N, pinned Jacob Hill, 1:15. 138: No. 14 Mario Barberio, M, pinned Mason Kauffman, 2:57. 145: Christian Good, M, dec. No. 17 Devan Blose, 6-5. 152: No. 9 Coleman Good, M, maj. dec. No. 21 Will Davis, 12-4. 160: Gavyn Eisenhower, M, pinned Bo Gothel, 1:21. 170: Ty Nixon, M, dec. Mason Huggins, 5-0. 182: Ethan Gush, M, pinned Brenden Leach, 4:29. Takedowns: Muncy 13, Newport 6. Records: Muncy (21-3); Newport (18-5). 285: No. 4 Colby Whitehill, B, pinned Gavin Hillman, 0:41. 106: No. 14 Owen Reinsel, B, pinned Alex Maiorana, 0:18. 113: Cayden Walter, B, dec. Chase Crawley, 4-1. 120: Grady Oden, M, dec. Josh Popson, 5-3. 126: Cabe Park, B, pinned Jacob Hill, 0:46. 132: No. 29 Bryce Vollman, M, dec. Parker Fleming, 4-2, sv. 138: No. 14 Mario Barberio, M, dec. Wyatt Kulik, 4-0. 145: Christian Good, M, dec. Cody Hetrick, 5-0. 152: No. 9 Coleman Good, M, dec. Jacob Cable, 9-2. 160: Gavyn Eisenhower, M, dec. Wyatt Griffin, 6-2. 170: Ty Nixon, M, dec. Cabe Park, 9-4. 182: Braden Macbeth, B, dec. Ethan Gush, 6-1. 195: Nathan Taylor, B, dec. Mike Kustanbauter, 12-6. 220: Cael Hembury, M, dec. Tanner LaBenne, 7-4. Takedowns: Muncy 17, Brookville 9. Records: Muncy (21-4); Brookville (18-3).